This instructor lead, hands-on course focuses on best practices to create professional looking documents and master time saving techniques for the daily use of MS Word. Students learn how to perform fundamental tasks, and create complex documents via lectures, lab exercises and assignments outside of class. Topics include: creating and managing documents; formatting text, paragraphs and document sections, applying styles for document consistency; inserting headers, footers and page numbering, creating and modifying tables and lists; inserting and formatting graphic elements; using object linking and embedding to create compound documents. Advanced topics include: automating a table of contents; building an index; tracking changes; mail merging; developing templates and forms; automating tasks with building blocks and macros. This course is an elective in Applied Computer Applications (ACA), and Technical Writing Associate Certificates. 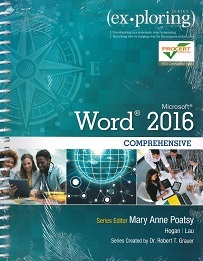 By the end of this course, successful participants will be expert end users of MS Word. COMP 2369 will be offered twice per year; April (BBY) and September (DTC). COMP 1002 or equivalent knowledge of a Windows PC, and file management. Identify the MS Word user interface components. Create, save, open, close, and print documents. Insert and edit text using find/replace; cut, copy and paste; format painter. Format text and paragraphs by applying font and paragraph formatting options; applying, modifying and creating styles, creating and modifying numbered or bulleted lists. Format documents by modifying page setup, inserting headers, footers, and page numbers. Control document layout with column and page breaks, section breaks, and formatting text into multiple columns. Insert, modify and format table layouts and design. Insert and format graphic elements, shapes, pictures and SmartArt graphics. Link and embed external data using object linking and embedding. Add references to documents: table of contents, footnotes / endnotes, citations and bibliography, captions, index and create cross-references. Use Word’s collaborative features: comments, track changes, and compare documents. Use a mail merge to create and personalize form letters, envelopes or mailing labels. Create templates and electronic forms to automate document creation. Work efficiently in Word using navigation techniques, shortcuts, macros, building blocks and by customizing the Word environment. Interested in being notified about future offerings of COMP 2369 - Microsoft Word? If so, fill out the information below and we'll notify you by email when courses for each new term are displayed here.